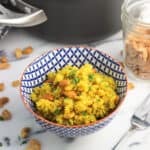 Coconut turmeric quinoa is a flavorful and healthy side dish recipe, made with creamy coconut milk and broth and mixed with cashews and fresh herbs. Heat a medium saucepan over medium heat and add olive oil. Add onion, garlic, ginger, and salt and stir to combine. Cook for 5-7 minutes, or until the onion is golden, stirring occasionally. Add dry quinoa and turmeric to the pan and stir to coat. Cook for 1-2 minutes to allow the quinoa to toast slightly, and then pour in the coconut milk and vegetable broth (or water, if using). Raise the heat to high and let the liquid come to a boil. Once boiling, cover saucepan and reduce heat to low to bring everything to a simmer. Simmer for 20 or so minutes, or until just about all of the liquid has been absorbed. Once the liquid is absorbed, remove the saucepan from the heat and let it sit for 5 minutes. Fluff quinoa with a fork, and stir in cashews prior to serving. Dry, uncooked quinoa is added to the saucepan with the sauteed onion/garlic/ginger in step #2 above. This toasts the quinoa slightly before the cooking liquid is added. Nutritional info is estimated based on the use of vegetable broth and lite coconut milk.